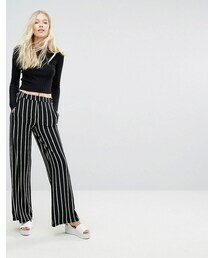 Pants by Bershka, Woven fabric, Striped design, Mid rise, Functional pockets, Wide leg, Regular fit - true to size, Machine wash, 94% Polyester, 6% Elastane, Our model wears a UK S/EU S/US XS and is 181cm/5'11.5 tall. Bershka has been dressing the young and adventurous since 1998. Influenced by the latest music, technology and social media trends, it upgrades your Saturday AM-to-PM style with cool denim, classic knits and awesome accessories.